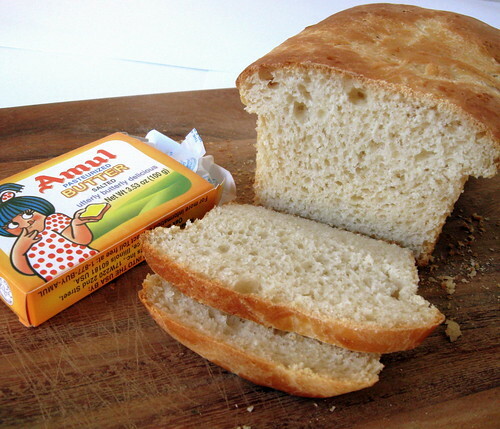 Milk Bread and a touch of Nostalgia, Awards and Honest meme..
For Mr. FSK, it is Amul butter toast dipped in chai! :) Whenever we visit back home, he has it every morning; almost burnt toast slathered with salty Amul butter, dipped in hot lemon grass tea that my PIL makes (oh that tea!! Sighhhhh). The pure joy that spreads on his face when he takes a bite of the tea soaked crust is a sight to cherish! And oh! It has to be Amul butter! The brand is infamous for their catchy cur ads with the omnipresent "utterly-butterly" girl dishing out a thick slab of the salty deliciousness! So, on a recent trip to the Indian grocery store, I spied a packet of the said butter and promptly picked it up. 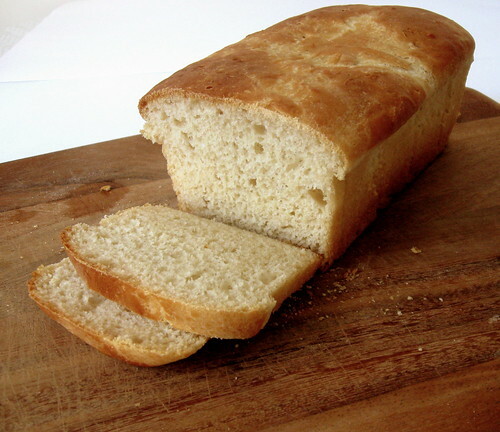 And, to complete the India reminiscence, I started hunting for a milk bread recipe because that is the bread that you invariably get in stores there. I still remember the "Milka" bread (South Indian brand) ads. I happened upon Smitten Kitchen's white batter bread and it looked so like what I wanted that I decided to try it out! Bingo! The bread was almost close to home.. The texture fluffy and light, almost cake like but not quite. 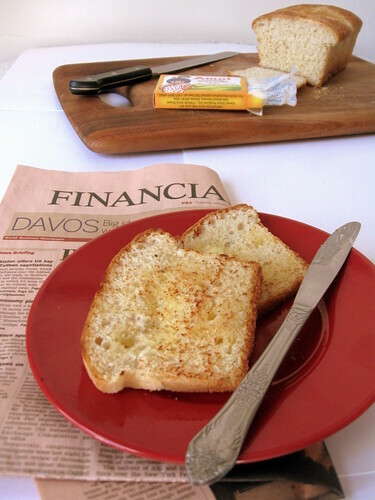 It doesn't make great sandwiches but is fantastic when slathered with butter and dipped in hot milky chai! :) And, yes, he had it that way and for the sake of humoring him, I did too..! Although, I will never develop a deep love for consuming it his way, it does make a great butter-toast bread! I am also taking this bread to Jamie's birthday party! Ok, perhaps not for the party itself, but the morning after! :)). Jamie is hosting Bread Baking Day #26 and inviting breads for her birthday party. Here is wishing wonderful Jamie a fabulous year ahead with lotsa perfect bakes and more happy Mac Attacks! Also, sending this our friendly,neighbourhood Yeastspotting team! Warm milk to 110F. Dissolve yeast in the warmed milk and let sit for a few minutes. Whisk together the salt, sugar and oil. Add the yeasted milk to this mixture. Beat the flour in to make a smooth batter. Note, emphasis on smooth. It take a few minutes and best done with a hand held whisk. Pour into an oiled loaf pan. Cover with a oiled plastic wrap and let it rise to double in volume. When it's almost there, preheat oven to 425F. When ready, pop the pan into the oven, lower the temperature to 400F and bake for 30 minutes or until the internal temperature registers 210F. Remove from oven and immediately unmold to cool on rack. If you leave it in the pan for too long, the bread steams on the sides and sogs up (no good!). Slice, be generous with the butter and enjoy! Books are my other passion. If you are ever wondering what to gift me, books are always perfect! Favorite meal course - dessert. And I am passing on these awards to these wonderful people I met and have gotten to know recently. They all have fabulous blogs that have provide a ton of inspiration! Diwali, the Indian festival of lights, is my favorite festival of all, and perhaps the grandest of all for most Indians as well :-). As a kid, the festival meant new clothes, uncensored gluttony and crackers day & night. As an adolescent, it was about catching up and hanging out with family and friends, exchanging wishes and sweets and ofcourse, unadulterated gluttony (that doesn't change with age!). When I moved out of India for work, initially, I would get sorely homesick around this time. 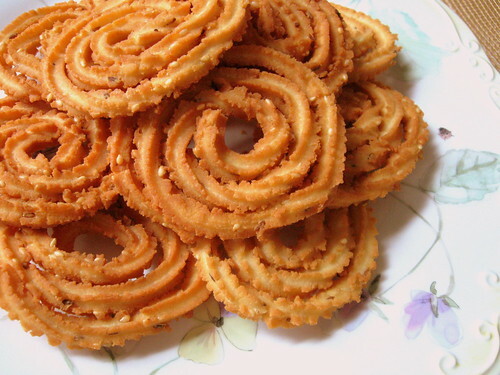 I missed the festive air, the happy laughter, the meeting and greetings and someone else who would make all the goodies ('palagarams' in Tamil) that I could devour. Slowly, as we made more and more friends, and many Indian ones, and I started taking an active interest in cooking, I could recreate some of that magic in our little abode here far away from home in India. Wishes were exchanged with family over the phone and with friends in real time. 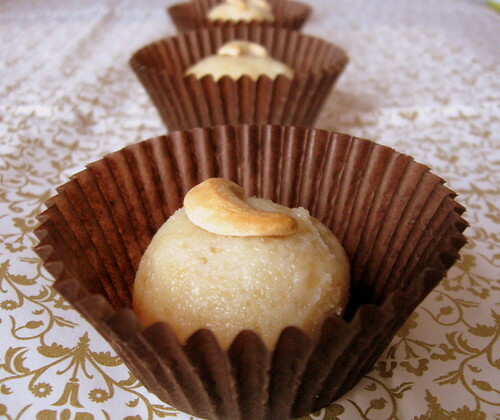 We host little parties for each other to share our homemade or store bought sweet as well as savory creations. For me, this is the time when I show my love through my hand made palagarams and I look forward to it very very much! So that's how we spent the day ... snacking on murukkus and indulging on cashew burfi while catching up with friends and wishing everyone a wonderful and prosperous year ahead!! And, I send you the same love and wishes to you all! 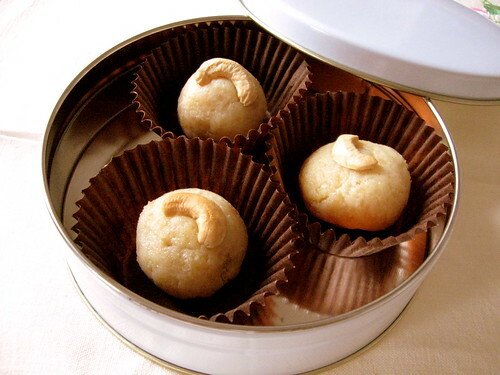 Roast cashews for 15 minutes in an oven preheated to 350 degrees until golden brown. Cool to room temperature. Process the cashews with the sugar to as fine a powder as you can. In a wide heavy bottomed pan, slowly reduce the milk over low heat to one-fourth its volume. Do not use a non-stick pan for this. It always burns at the bottom and burnt milk does not make any good sweet! When the milk is reduced, stir in the cashew mixture and cook for 30 minutes more until the mixture comes away from the sides of the pan and very thick. Pour into a greased cake pan. Once the mixture has cooled enough to handle, spoon out about a tablespoon of the burfi onto to lightly greased hands and roll into a ball. Top each with a roasted cashew as garnish. Sift together the flours, semolina and salt. Stir in the cumin, caraway and sesame seeds. Add the melted butter to make a crumbly mixture. Slowly add water to make a dough that just comes together; much like a shortbread dough. Grease your palms and knead the dough until it comes away from the sides of the pan. Cover with a damp towel and let it rest for 30 minutes. When ready to fry the murukkus, heat oil in a small wok to 350 degrees. Maintain the flame at low. 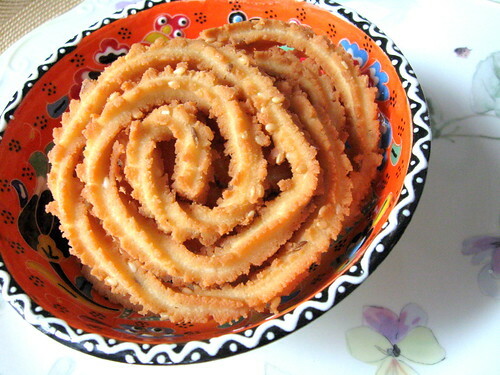 If you have a murukku maker, choose the shape you want and fill with the dough. You can get one of these handy little things at an Indian store. If you can't find one, fret not, you can use a cookie press as well. On a clean plastic shape, press out shapes and then transfer into the oil. Fry until golden brown and there are no bubbles in the oil. Remove onto a kitchen towel to soak any excess oil. You can store in an airtight container for a week.